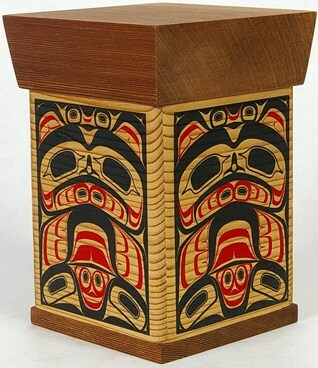 Bentwood boxes are one of the most outstanding items manufactured by Native people of the Pacific Northwest Coast, including parts of southern Alaska, western British Columbia and southern Washington. Made by kerfing and steam bending a single plank to form four sides, the containers with a height greater than their width are called boxes, while those with a length greater than their height are referred to as chests. Historically, boxes came in various sizes from small (measured in inches) to massive (large enough to provide seating). Some undecorated, others carved or painted or both. The highly decorated ones were symbols of wealth. Fishermen used boxes shaped to fit into their canoes to carry tackle and supplies. Some were used for cooking (filled with water and hot stones) while others were used for storage of food, clothing, tools, or supplies. A silk screened steam bent yellow or red cedar box. Available with black or natural top and bottom. By James Michels. These are custom made, so please allow 2 weeks delivery time. Design meaning: Strength. Introspection. Learned humility. Motherhood & teaching. About the artist -James Michels was born on July 29th 1969 in Merritt, BC. He is a highly accomplished Cree/Metis artist whose creations are held in high esteem by other artists and knowledgeable collectors. James apprenticed with acclaimed Coast Salish artist Joseph Campbell as well as spent considerable time observing various master artists at the K'san Native Art School. His bentwood boxes and stunning carved panels can be regularly viewed in most of the major galleries of Northwest Coast artwork in both Canada and the United States. James Michels has worked on a large commission of a series of bentwood boxes for the Canadian Government. He also commissioned a series of his bentwood boxes for the participants of the 2005 PGA Golf Skins game in Whistler, BC. As well, his artwork has been purchased by former President Bill Clinton, Former Prime Minister Paul Martin and singing legend Joni Mitchell. James is also sought after for his exceptional large carved panels and totem poles.